-43% OFF on This Product 2019 : Today Only! If you are interested to wear the colorful upper which is also famous among the people of your surrounding then you have to consider the Harley Quinn jacket. This character is been shown two different movies in Batman Adventures and lately in one of the super hit movie Suicide Squad. This character has been portrayed by Margot Robbie and she wore out this beautiful and attractive attire. William Jackets bring the same feature jacket for your which is made with satin. It contains viscose lining interior for your more comfortable wearing. It has full front zip closure along with rib knit collar. This jacket has full-length sleeves with same rib knit cuffs. 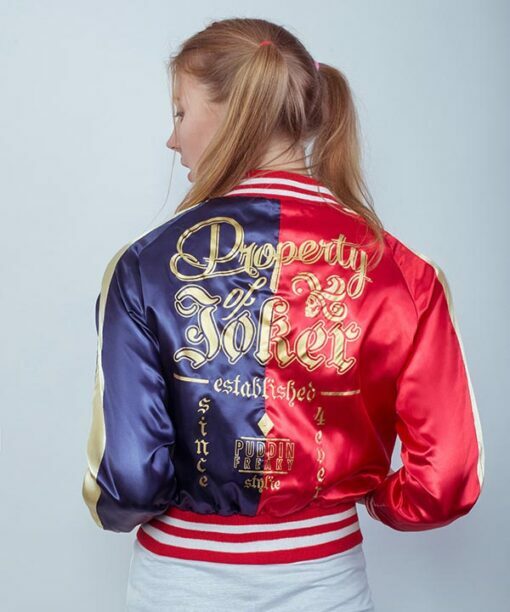 Suicide Squad Harley Quinn’s satin jacket has an attractive back with the iconic title of “Property of Joker” which is actually real identity of Harley Quinn. Oh… my… god. This is the most BEAUTIFUL, most GORGEOUS jacket I have ever seen! It arrived today. I do not regret a penny spent on this jacket! It is so beautiful, and matches the movie EXACTLY! I ordered one size up, a large, and it fit me perfectly so definitely go a size up! But other than that, I have no complaints, and the glitter print is beautiful and I LOVE how the glitter doesn’t get everywhere! A+ ! Will do business again! Harley Quinn Jacket my love. you are finally here. It’s so beautiful. EVIL BEAUTIFUL girl. I like how he keeps his partner always attracted towards her by having the same looks as his partner wants. I want to be like her. the jacket looks great and the same and exact copy that I saw in the movie. Yahoo… I want a big size. it would appear that I am getting more fortunate as each time I begin with William Jacket. It happens to come across something I would have pondered going to pick that someplace so as to wear. This Jacket is great I am unquestionably going to love to purchase it. Try not to need to lose this Harley Quinn jacket for this time. Really fine quality satin material and lightweight, my friend really happy to have such a gift. It was a ladies jacket although, but I found it super fit and attractive because of its unique color full combination. I convey the same as I received. Thanks to William Jackets which make me more respectful in front of my friend. Seems really comfortable over the net but more comfortable in real, I spend the time to figure out a colorful jacket for my daughter. I am not the in such age where I can wear this attire. But I can feel it by seeing my daughter. Thanks to Mr. Mark who make that creative design with colors which actually worth to the money I spend on it.